If you were born after in the 90’s you will probably laugh as you watch the following video. Now try to listen to the words of the song and not focus on the large mustache. If you were born before or right after 1973, go ahead and sing along, you know you want to. By the way, I immediately wanted to search for, watch and sing Knock Three Times, didn’t you?!?! Oh no, I couldn’t help myself…found it, watched and sang it too. This popular song, Tie A Yellow Ribbon by Tony Orlando and Dawn, was based on the true story of a convict returning from jail who requested a sign from his wife to indicate that she would welcome him home. First he writes her a letter and puts it in the mail, text messaging, emails or cell phones didn’t exist back then. Ok so go ahead and laugh again those of you who laughed earlier. He doesn’t wait for her to rejection him, instead he jumps on a bus to go to her. In his letter he ask her give him a visual sign that she will take him back, a yellow ribbon around a tree he remembers in the front yard of her home. As the song goes on you can hear the anticipation, urgency and yes even fear in the lyrics as he gets closer to her house. Rejection will be hard but easier to handle if he doesn’t have to see her face to face and hear the word NO. That’s why he has ask for visual sign. Almost there, tension building, all the feelings of rejection and discouragement overwhelm him to the point that he can’t even look, can’t look for the sign he asked for a simple yellow ribbon around big old oak tree that he remembers standing in the front yard. He has pulled the other passengers on the bus into his story by telling them about his love and how he hopes she will take him back, about the simple sign of acceptance he hopes to see and his fear of not seeing it. The passengers tell him he doesn’t even have to look, they will be his eyes. They too are now hoping and looking for HIS yellow ribbon on the tree. As they near the house I can see EVERYONE but the man standing on the same side of the bus stretching to see over the others to see if the simple yellow ribbon requested is on the tree. I can imagine as the man hears the shouts and cheers is he excited and stands to see what they see. 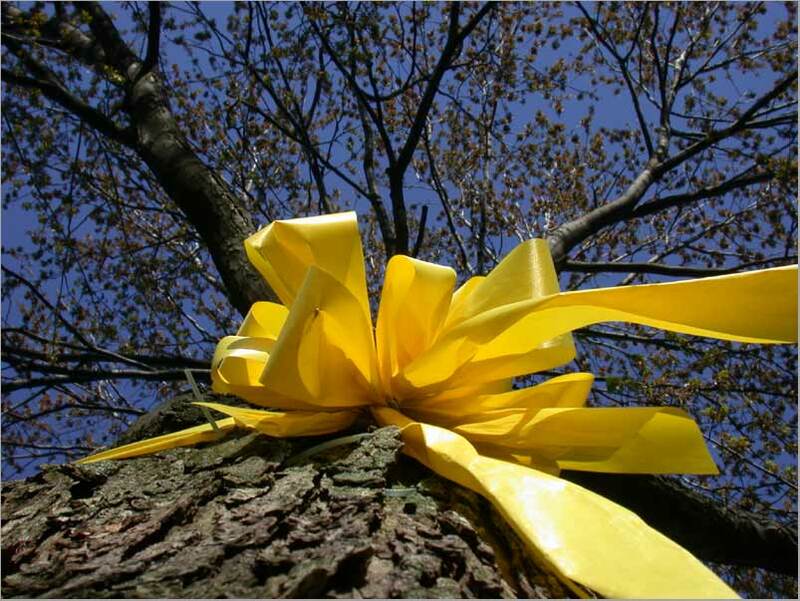 It turned out that he was very welcomed home: there were a hundred yellow ribbons on that old oak tree. Whew, I almost want to cry and shout with joy myself as I am typing the description of this song. This song really hits home with me not because I have lost an old love who was in prison or been separated from husband before, but because I know so many who have lost their love for Jesus. Todays scripture talks about returning to your first love, God. So many have strayed far away from God, almost forgotten that they were saved. Fear somehow replaced the faith they once had, causing them to run away from God and go back into the sinful world of the flesh to satisfy their doubt and unbelief. Have you or someone you know left God, been a prison of sin, and want to return but you have the same fears and anxiety about rejection as the man had in this song? If you want to return to God you can do it. First you have to decide that you are tired of doing it your own way and remember that doing things God way is more satisfying. Proverbs 14:14 says: A heart that turns from God becomes bored with its own ways, but a good person is satisfied with God’s ways. (GW) YOU and only you can decide that you are tired of living the way you are. So how do you return to God? So change the way you think and act, and turn to God to have your sins removed Acts 3:19 (GW) Ask God to forgive you, get back into the word, and let God blot out your sins. It’s that simple. Just pray and ask God to forgive you and clean you up and HE DOES. How wonderful and amazing is that? No rejection letter, no door slammed in your face, just yellow ribbons all over the oak tree for you. Just like in the song not only will God say yes but He will say emphatically yes. Now that you have been given the forgiveness to come home you should be careful so you do not stray away again. Jesus said, “Stay awake, and pray that you won’t be tempted. You want to do what’s right, but you’re weak.”, Matthew 26:41(GW). Tell other Christians about your return home to let them rejoice with you, like the passengers on the bus rejoiced with the man in the song. Ask them to pray for you and with you. Welcome home my friend. Dear Lord, I am sorry for leaving You, my first love. Sometimes the pull from the world is so strong that I can lose my way. Help me to stay strong through the reading of your word, prayer and meeting together with other Christian brothers and sisters. Thank you for forgiving me, for loving me and for allowing me to come home. Let my light burn brightly once more for you. Hear my heart, Lord, and ignite my passion for you in a, fresh and dynamic way. In Jesus Name. AMEN. I bet when you read the title for today’s devotional you immediately thought that I was going to write about a wedding. God is getting ready to take me on a new journey in my life and I knew that I wanted to share it with you to encourage you. I thought of several titles and many scriptures that I could use but this morning when I awoke both of these came to my mind for this devotional. God may be getting ready to do something amazing for you too and you are holding back because of fear. Let me tell you that I am more afraid of not doing what God wants me to do than I am of doing it. 10 years ago I decided to retire early from a company that I had been with over 13 years, leave an industry I had worked in for over 17 years, and step down from an executive job making 6 figures. I can assure you this was not an easy decision for me to make and I struggled for a long time before making it. I knew for a long time that I should do this but just couldn’t make sense of it financially. Through prayer and discussions with my husband we came to the conclusion that the time had come for me to retire and help him full-time in the new church he had been called to pastor. That was almost 10 years ago and needless say I have been retired, semi-retired and out of retirement throughout that time. Here I am again 10 years later struggling with what to do regarding my job. SOMETHING OLD. I feel that God is telling me it is time for me to retire AGAIN. My husband and I just finished a financial class and decided that I would work until we were debt free. We have been working on that for almost a year now and we still have a way go before reaching that goal. Leaving a good job that pays in an economy that isn’t hiring doesn’t make sense anyway you look at it. BUT I know this is the right “God” thing for me to do. I have felt for a while now that God wanted me to be an encourager. Lately I have gotten confirmation on two new area’s that I believe God is leading me into. SOMETHING NEW. I have never written a book, however in just the last 3 days I have written titles for 3 books and outlined the chapters of those books. AMAZING I KNOW! I also think I am being called to public speaking for women’s events/ministries to encourage women of all ages. I do have the gift of gab, many who know me will testify to that, lots of experiences I can share and I love to motivate and encourage women with the Good new of Jesus Christ. During this transitional time of my life I have talked to many Christian women at different stages of their spiritual maturity and been encouraged myself. SOMETHING BORROWED. So many women have shared with me how God has intervened in their life with a career change that changed their life. Through their stories I have been motivated that I have made the right choice. I am not afraid of the financial impacts, the new career path I am taking or the what if’s. Their stories, their prayers for me and the scriptures they shared with me have just fueled the fire and have me counting the days until my new journey begins. I will miss my co-workers, clients and employer where I currently work. SOMETHING BLUE. I will miss my daily routine, dressing up to go to work each day and having my office with people around me. Everywhere I have worked throughout my life I have made friends, along with a few friendimies, that I have to leave behind with the job. You always leave with the greatest of intentions of staying in touch and sometimes you do, but mostly you don’t. As I look back into the rearview mirror I see a career that I thought I would stick with for many more years to come. God has a different plan though. All I know for sure is that my God GPS has my new destination mapped out. No matter how far out I take the map I can’t see where it ends. I have my car packed though and I am ready to go wherever he takes me. I think I am in for an awesome ride with new adventures and new challenges that with him are all possible to achieve. Is he calling you do something that sounds crazy? Are you miserable where are now? Maybe God has something in store for you and He is just waiting for you to trust Him and “JUST DO IT”. As the old bible hymn says..Trust and Obey. I encourage you to “Just Do It”, whatever it is. Dear Lord, we know that you are in control of our lives. Sometimes, we forget you have bigger and better plans than we could ever have planned for ourselves. Help us to trust you, to obey you and “just do” whatever it is you are calling us to do. In Jesus Name. AMEN.